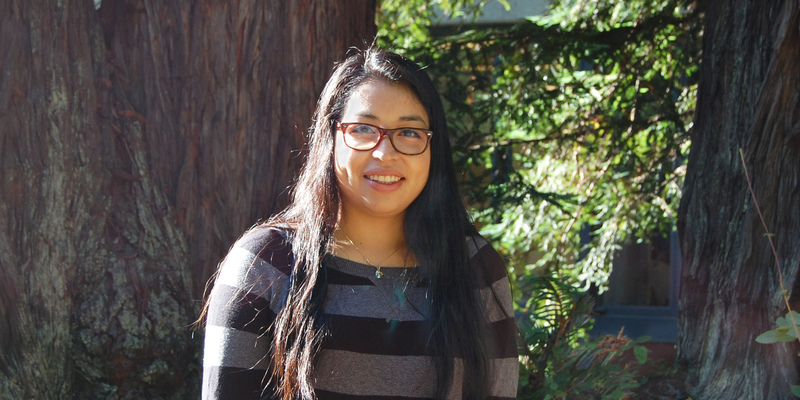 Juliana Hernandez, an electrical engineering Ph.D. student at UC Santa Cruz, is spending her summer working with Sara Abrahamsson on a research project which involves using specially designed diffractive optics components for super-resolution microscopy. She’s also a mentor to two high school student interns who are assisting with her research as part of the Science Internship Program, which offers high school students the opportunity to spend a summer alongside UC Santa Cruz professors, post-doctoral scholars, and graduate students. The program provides a valuable learning experience for the interns, but Juliana is learning valuable skills as well, like how to effectively delegate assignments to her interns. “It’s fun to work with the high school students,” Juliana explained, “but sometimes it can be challenging to keep them busy because they’re so smart and they finish their tasks quickly. The interns are assisting Juliana in building a multifocal structured illumination microscope (MFSIM) by combining structured illumination microscopy (SIM) and multifocus microscopy (MFM) in order to obtain fast, super-resolution 3D images. The resulting microscope will initially be employed in research projects in UC Santa Cruz’s Molecular, Cell and Developmental Biology Department. “We want to image live cells, which move around. With the multifocal aspects of the MFSIM, we’ll be able to get 3D images and with the structured illumination aspect, we’ll be able to get super-resolution images,” Juliana explained. Juliana has enjoyed conducting research in Abrahamsson’s SaraLab and has received guidance and support from Sara. “Sara has been really helpful and I’ve enjoyed her kind of research in Fourier optics. It’s really interesting to me,” she said.